Grit Academy in Malmö has three courses available in Malmö for the fall term of 2019. · B2B Sales Training (B2B-säljutbildning) gives you the resources to become a professional business seller who is in demand in the labor market. The education entails a quick way into a profession where you have great opportunities to develop and advance within an organization or a company. This course is full time and is set for 80 weeks and starts fall 2019. The last day to apply is 2019-05-17. · Strategic Buyer (Strategisk Inköpare) education prepares you for the responsibility to contribute to the competitiveness and development of the business. This two-year strategic purchasing education gives you the tools you need to become a professional purchaser, a profession that requires increasingly specialized skills. This course is full time and is set for 80 weeks and starts fall 2019. The last day to apply is 2019-05-17. · Java Developer (Javautvecklare) course prepares you to work in an industry that contributes to Sweden being able to take advantage of the possibilities of digitization. GRIT Academy’s training in Java development gives you the resources to become the professional java developer who is in demand in the labor market. The two-year education means a quick way into a profession where there is a great lack of skills. This course is full time and is set for 80 weeks and starts fall 2019. The last day to apply is 2019-05-17. Medieinstitutet in Malmö has five courses available in Malmö for the fall term of 2019. · Front End Developer (Front End-utvecklare) course is for those who want to work with modern web development with a focus on responsive web and mobile platforms. This training for Front End developers gives you full stack skills. This course is full time and is set for 80 weeks and starts in August 2019. The last day to apply is 2019-05-15. · Online Marketer (Onlinemarknadsförare) is the education for those who want to work with search marketing, digital advertising, content marketing, media planning and campaign coordination in digital media. This course is full time and is set for 80 weeks and starts in August 2019. The last day to apply is 2019-05-15. · Web Analyst (Webbanalytiker) is the education for those who want to gain special competence in web analytics, data-driven marketing, conversion optimization and digital business. This course is full time and is set for 80 weeks and starts in August 2019. The last day to apply is 2019-05-15. · Web Developer CMS (Webbutvecklare CMS) education will teach you how to develop websites for different platforms and devices but also web development for Content Management Systems, CMS. This course is full time and is set for 80 weeks and starts in August 2019. The last day to apply is 2019-05-15. · Web Communicator Social Media (Web Communicator Social Media) education focuses on professional communication on the web and in digital media. This course is full time and is set for 80 weeks and starts in August 2019. The last day to apply is 2019-05-15. IHM Business School in Malmö has four courses available in Malmö for the fall term of 2019. · The Digital Analytics Specialist (formerly Digital Marketing & Sales Analytics) gives you skills for a career as a web analyst. This course is full time and is set for 80 weeks and starts on 2019-08-26. The last day to apply is 2019-05-06. · Account Manager Digital Solutions (formerly Seller IT Solutions B2B) teaches you to master sales of digital services, create long-term business relationships, drive projects and lead customers towards increased profitability via digital solutions. This course is full time and is set for 80 weeks and starts on 2019-08-26. The last day to apply is 2019-05-06. · E-commerce Manager course gives you the skills to drive and develop e-commerce and digital marketing. This course is full time and is set for 80 weeks and starts on 2019-08-26. The last day to apply is 2019-05-06. · Economy & Accounting Consultant (Ekonomi- och redovisningskonsult) education is for those with accuracy, analytical ability, good communicative skills and prepares you to be an accounting consultant in the finance department or an accounting firm. This course is full time and is set for 80 weeks and starts on 2019-08-21. The last day to apply is 2019-05-06. EC Utbildning in Malmö has three courses available in Malmö for the fall term of 2019. · IT-support – Technical Operations Specialist education equips you for work with service and support within IT at advanced level. This course is full time and is set for 46 weeks and starts in fall 2019. The last day to apply is 2019-04-30. · Java Developer (Java Developer) education has a strong focus on mobile development in Java and test-driven Java development. This course is full time and is set for 1.5 years and starts in fall 2019. The last day to apply is 2019-04-30. · Software Tester (Mjukvarutestare) education makes you a professional software tester with good practical skills. During the training you will perform tests, bug search and troubleshooting, understand requirement specifications and work with bug reporting. Stockholms Internationella Handelsskola in Malmö has three courses available in Malmö for the fall term of 2019. · Freight forwarder / Logistics with environmental profile (Speditör/Logistiker med miljöprofil) program aims to provide good competence for practical and independent work as a freight forwarder / logistics company with an environmental profile, a challenging job that requires everything from language competence to knowledge of logistics solutions, transport and sustainability. This course is full time and is set for 80 weeks and starts in fall 2019. The last day to apply is 2019-04-28. · International Purchaser (Internationell inköpare) education aims to provide good competence for practical and independent work as an international purchaser. As a purchaser, you must master all the steps in the purchasing process and be able to work with both operational and tactical purchasing issues, such as supplier assessments, purchasing development and business negotiations. This course is full time and is set for 80 weeks and starts in fall 2019. The last day to apply is 2019-04-28. · International Accounting (Internationell redovisningsekonom) program aims to provide good competence for practical and independent work as an International Accountant, a position required by all industries, by small and large, private and public, as well as national and international companies. This course is full time and is set for 80 weeks and starts in fall 2019. The last day to apply is 2019-04-28. The Game Assembly in Malmö has five courses available in Malmö for the fall term of 2019. · Game Animator training at Game Assembly is a 2D and 3D animation training. The training begins with the basics of 2D and ends as advanced 3D animation. This course is full time and is set for 2.5 years and starts in fall 2019. The last day to apply is 2019-04-30. · Technical Artist education is for those who have an interest in graphics and programming. The training is at a high pace and starts with tasks at a relatively high level within 3D graphics and work within game engines. This course is full time and is set for 1.5 years and starts in fall 2019. The last day to apply is 2019-04-30. · Game Programmer (Spelprogrammerare) training at The Game Assembly gives you knowledge of the most common data structures and algorithms used in game development. This course is full time and is set for 2.5 years and starts in fall 2019. The last day to apply is 2019-04-30. · Level Designer (Leveldesigner) trains you for how companies use level designers in different ways. TGA trains you so that you get insight into all possible roles that the working life offers. This course is full time and is set for 2.5 years and starts in fall 2019. The last day to apply is 2019-04-30. · Game Graphic Artist (Spelgrafiker) training focuses primarily on 3D, but also contains an introduction to 2D and concept art. TGA trains for the entertainment industry, it is very much about communication and feedback. This course is full time and is set for 2.5 years and starts in fall 2019. The last day to apply is 2019-04-30. Humanus Yrkeshögskola in Malmö has one course available in Malmö for the fall term of 2019. · Object-oriented Programming with AI Competence (Objektorienterad programmering med AI-kompetens) education focuses on object-oriented programming in C # and Java and work in practical projects. A course deals with AI, Artificial Intelligence, where you gain knowledge of Microsoft’s AI platforms, deepening in Java and knowledge of Python programming. This course is full time and is set for 60 weeks and starts fall 2019. The last day to apply is 2019-05-17. Newton Kompetensutveckling in Malmö has six courses available in Malmö for the fall term of 2019. · System Developer .NET (Systemutvecklare .NET) education is focused on both software-based and cloud-based applications. During the training you will learn various tools to be able to create mobile applications, programs for companies, games, applications for cloud services and embedded applications. This course is full time and is set for two years and starts in fall 2019. The last day to apply is 2019-05-06. · System Developer Java (Systemutvecklare Java) program teaches you various tools to be able to create mobile applications, programs for companies, games, applications for cloud services and embedded applications. This course is full time and is set for two years and starts in fall 2019. The last day to apply is 2019-05-06. · Building Engineer – Digital Building (Byggnadsingenjör – Digitalt Byggande) program includes both internships, projects and theoretical subjects, with the goal that after completion of education you have the ability to plan, coordinate and complete building-related projects. This course is full time and is set for two years and starts in fall 2019. The last day to apply is 2019-05-06. · Tester (Testare) of software, applications and services is a varied and instructive profession. The tester education teaches you to work with IT systems and applications that are to be developed or changed. You test and check the user-friendliness and functionality before systems get used. This course is full time and is set for two years and starts in fall 2019. The last day to apply is 2019-05-06. · Technical Manager (Teknisk Förvaltare) education is focused on property management where you often work with real estate projects of a technical nature such as remodeling, renovations and energy efficiency improvements. You are responsible for running and developing technical maintenance regarding operations, finances, security, energy savings and the like for one or more properties. As a Technical Manager, you need to have knowledge of technical real estate systems, while you are familiar with questions about finance, law and communication. This course is full time and is set for two years and starts in fall 2019. The last day to apply is 2019-05-06. · Property Manager (Fastighetsförvaltare) has a key role in the property company and the overall responsibility for the management of one or more properties. Newton educates you all the opportunities for a successful career in the real estate industry. Through Newton’s close collaboration with prominent industry companies, the education is designed according to the competence requirements that companies today demand. This course is full time and is set for two and a half years and starts in fall 2019. The last day to apply is 2019-05-06. Lernia in Malmö has two courses available in Malmö for the fall term of 2019. · Health and Medical Manager (Hälso- och Sjukvårds­administratör) educatioin will look closely at the laws and regulations governing healthcare, anatomy, medical terminology, health documentation and basic diagnosis classification. You will also learn how to lead projects, communicate orally and in writing, understand how a business works and develops and study how the healthcare organization is governed. This course is full time and is set for two years and starts in fall 2019. · Emergency Ambulance Medical Technicians (Ambulanssjukvårdare) work in the ambulance during emergency and are responsible for driving, communication, medical equipment / technology and assisting the ambulance nurse or other medical staff in prehospital emergency care. You will learn how to use RAKEL for radio communication, prehospital health care, emergency care, about which drugs are used in the ambulance, how to communicate with patients and relatives, and turn and turn ethical concepts that concern the work of an ambulance. This course is full time and is set for one year or half time for two years and starts in fall 2019. Hermods in Malmö has six courses available in Malmö for the fall term of 2019. · International Transport Logistics (Internationell Transportlogistiker) professionals work with planning, organizing and executing transports in the most efficient and profitable way possible. The transport industry is becoming increasingly global and is constantly changing, which places great demands on current expertise. The education provides you with the right logistics skills that prepare you for an international career if desired. This course is full time and is set for two years and starts in fall 2019. The last day to apply is 2019-04-30. 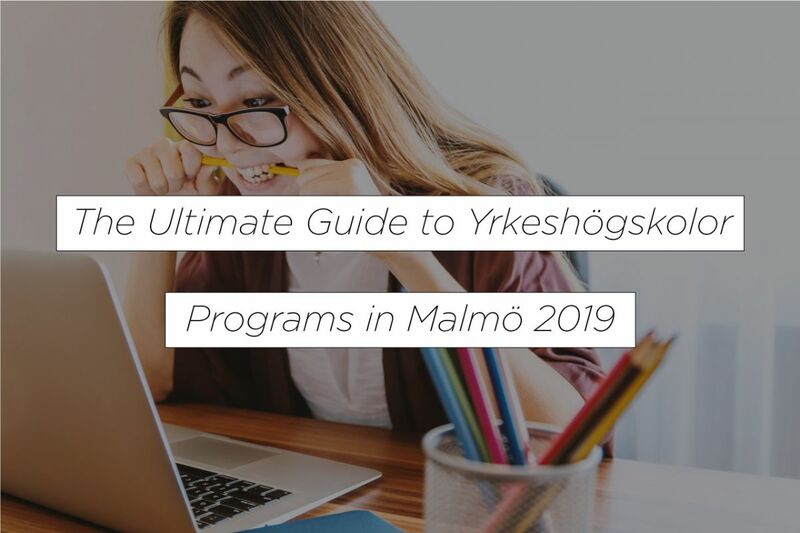 Kyh in Malmö has six courses available in Malmö for the fall term of 2019. · Solar Energy Project Manager (Solenergiprojektör) has the chance to work in one of the world’s fastest growing industries. Interest in sustainable energy solutions is growing both by private individuals and in the planning of large construction projects, only in 2017 did the solar energy market grow by as much as 50%. You become a key person in the company as this type of education has been lacking in many parts of the country and new expertise is necessary for the industry to continue to grow in step with demand. This course is full time and is set for two years and starts in fall 2019. The last day to apply is 2019-05-17. · Property engineer – technical systems and operation (Fastighetsingenjör – tekniska system och drift) is a specialist with responsibility for the operation, maintenance and maintenance of the property’s technical system. It ensures the requirements for operating economy, energy performance and energy efficiency, as well as the tenant’s wishes for indoor climate and stable operation. A property engineer / qualified real estate technician has in-depth and broad knowledge of real estate technology and technical property responsibility for one or more properties. This course is full time and is set for two years and starts in fall 2019. The last day to apply is 2019-05-17. · Construction Production Manager – ROT (Byggproduktionsledare – ROT) lead the work of maintaining and renewing Sweden. There are enormous renovation projects in the big cities of worn-out buildings and homes. With the continued strong digital and technological development in the construction industry, and increasingly higher political requirements within the environment, energy efficiency and sustainability, you have to work in a very exciting role that requires good analytical skills and involves a lot of problem solving. This course is full time and is set for two years and starts in fall 2019. The last day to apply is 2019-05-17. · Measurement engineer – Construction and planning (Mätningsingenjör – Bygg och anläggning) is the key player who has a specialist competence that is needed throughout the construction and construction process. Measurement engineers handle the measurements for the entire building, review drawings and input technical data into computer programs. Some examples are construction production measurements, 3D scanning, geodata, machine control and road construction. This course is full time and is set for two years and starts in fall 2019. The last day to apply is 2019-05-17. · Energy Specialist in Building (Energispecialist Byggnader) has the skills to do energy investigations, propose energy efficiency measures and work in projects that are about energy efficiency and indoor climate. Today, energy-efficient solutions are the most important issue in the community building sector. As an energy specialist in buildings, you work with different types of construction projects at all stages, from early planning to follow-up, where you, for example, produce documentation, analyzes, investigations, investment plans and decision-making documents for clients. This course is full time and is set for two years and starts in fall 2019. The last day to apply is 2019-05-17. · Payroll Consultant (Lönekonsult) profession works with wage process in combination with increasingly complex laws and regulations, self-service and increased globalization places increased demands on the wage profession, which also clarifies the versatility of the role. The future payroll consultant works process-oriented and takes a key role in the companies, as the payroll systems contain important information about most companies’ largest resources; employees. This course is full time and is set for one and a half years and starts in fall 2019. The last day to apply is 2019-05-17. NBI in Malmö has two courses available in Malmö for the fall term of 2019. · Purchasing and Supply Management (Inköp och Supply Management) The goal is that after completing the training you will master all the steps in the purchasing process and be able to work with operational and tactical purchasing issues such as supplier assessments, material calls and the establishment of purchasing calculations. In short – you are well prepared for the professional role as a purchaser. This course is full time and is set for 85 weeks (over two years) and starts in fall 2019. · Paralegal – Legal Assistant (Paralegal – Juridisk Assistent) education means you can work as a legal assistant, paralegal, court officer, lawyer secretary, prosecutor secretary and licensee. Invest in your future and increase your competitiveness in the labor market. This course is full time and is set for two years and starts in fall 2019. TEC Travel Education Centre in Malmö has two courses available in Malmö for the fall term of 2019. · Management in hotel and hospitality (Management inom hotell och besöksnäringen) teaches about hosting, leadership, sales and marketing in digital channels. Topics such as intercultural relations, sustainable development and security also mean that you get an education that is at the forefront. This course is full time and is set for one and a half years and starts in fall 2019. The last day to apply is 2019-05-15. · International Travel Consultant, TRAC with IATA (Internationell Resekonsult, TRAC med IATA) education is for those who want to work with planning, sales and booking in the travel industry with knowledge in sustainable travel and destination knowledge. This course is full time and is set for two years and starts in fall 2019. The last day to apply is 2019-05-15. Stockholm Business of School in Malmö has two courses available in Malmö for the fall term of 2019. · B2B Seller (Säljare B2B) education teaches you business economics and law and to master the digital channels for qualified sales. The education provides a competitive competence profile with a focus on sales, business acumen, marketing communication and procurement. This course is full time and is set for two years and starts in fall 2019. The last day to apply is 2019-05-15. · Payroll Specialist (Lönespecialist) education is for those who want to work as a salary specialist, a professional role where you often have a key role in the company. You can work as an advisor or consultant. Learn how to manage a company’s salary management and all practical steps during one year’s payroll. Take care of staff administration issues and communication efforts. You get expertise in business economics, payroll management and personnel administration. This course is full time and is set for one and a half years and starts in fall 2019. The last day to apply is 2019-05-15. Malmö stad Yrkeshögskolan Malmö has one course available in Malmö for the fall term of 2019. · Service Manager – for future tourism education aimed at the hospitality industry. We believe that you who want to go the education are driven and ambitious, and that you want to increase your skills and deepen your knowledge to become a good leader. This course is full time and is set for one and a half years and starts in fall 2019. The last day to apply is 2019-04-30. Företagsuniversitet in Malmö has one course available in Malmö for the fall term of 2019. · Safety and Security Coordinator (Säkerhets- och t Trygghetskoordinator) focuses on: ·Risk Management including risk and vulnerability analysis ·Methods for crime prevention and security-creating measures ·Emergency Management ·Procurement, contract law and general safety-related legislation ·Event security including Crowd Management and Crowd Control … and more. This course is full time and is set for three terms and starts in fall 2019. The last day to apply is 2019-05-08.